The American Alligator is our largest native Texas reptile. Like other reptiles, i.e. snakes, lizards and turtles, they are cold-blooded and depend upon the air temperature of their surroundings. They become less active and may burrow into the ground when the temperatures are below 60 degrees. The American alligator was once very common in rivers, creeks, and backwater sloughs of East and South Texas. Unregulated market hunting and habitat alteration resulted in near extinction of the species in Texas by the 1950’s. Legal protection, enhanced habitat conditions, and new water impoundment projects have resulted in a rapid repopulation of Texas by alligators during the past 20 years. To complicate matters, an ever-expanding human population continues to encroach upon the alligator’s domain. These factors contribute to increased encounters between alligators and people. An alligator is typically not seen when in the water – except for its eyes. An alligator’s length can be determined by estimating the distance between its eyes. For each inch, calculate one foot. Ten inches between the eyes is approximately a ten foot long alligator. Most Texas alligators are 5-6 feet long and weigh just 25-35 pounds. Alligators can live up to 30 years in the wild. Alligators, like other reptiles, don’t need to eat as much as we do. Alligators are native to the North Texas area and live in various freshwater lakes and rivers, including Lake Worth, Eagle Mountain Lake and the Trinity River. Alligators are limited by habitat type and temperature requirements, so they are primarily concentrated in southern and eastern portions of Texas – as indicated by the dark green shading on the map below. In the lighter green shaded areas below, the habitat and temperature for alligators is only marginal, so that alligators are more limited and scattered in pockets in these areas which includes the Dallas-Fort Worth Metroplex. Mature alligators typically eat rough fish like carp, small mammals, birds, turtles, snakes and frogs. Their diet changes as they grow larger – preferring larger food items as they age. Small alligators typically eat spiders, insects, crawfish, shrimp, minnows and crabs. As they grow larger (over 3 feet in length) turtles, fish, frogs, snakes, carrion (dead animals) and small birds become part of their diet. Alligators are opportunistic in their feeding habits – meaning they will eat whatever is easiest to come by. Occasionally, an adult alligator will eat wading birds, muskrat, waterfowl, raccoons, nutria, feral hogs, and even white-tailed deer. Alligators play a vital role in the ecology of our Texas wetlands, and are an important part of our Texas heritage. When do Alligators reproduce in Texas? Females lay their eggs in June and July in an above-ground mounded nest. The nest may contain 15 to 60 eggs (a clutch). The baby alligators (a pod) hatch after 65 days, in late August/early September, and are about 8 inches long when born. Baby alligators will grunt if separated from their mother, or when they’re hungry or afraid. While baby alligators may look cute, NEVER try to remove alligators from their natural habitat or try to keep one as a pet. It is strictly against the law to do so. Alligators do not become tame in captivity and handling even small ones may result in bites. Instead, enjoy watching and photographing alligators from a distance. Is it okay to feed Alligators or other wildlife? NO! DEFINITELY NOT! NEVER put out food for wild animals, except for birds or squirrels. Deliberate feeding of wildlife puts you, your pets, your neighbors, and even the wildlife at risk. Observing wildlife is a wonderful way to interact with nature; however, the experience can turn unpleasant or dangerous when well-meaning people feed wildlife. Intentional feeding can make wildlife unnaturally bold, and will lead to conflicts. It is necessary for wild animals to remain fearful of humans. Feeding of wildlife may seem like a positive way to interact, but it creates an unnatural situation in which wildlife become less fearful of humans, become habituated to free handouts can cause the spread of disease as animals eat in close contact, can attract other predatory wildlife to the feeding location, and can cause conflict with neighbors who do not appreciate the nightly wildlife buffet line going through their yards. Feeding wild animals does much more harm than good. Do not ever throw food to alligators. Wild animals, such as alligators, that lose their fear of humans can become dangerous to the feeder, as well as to the surrounding residents, resulting in conflict that ends with the wildlife being trapped and euthanized because of the perceived threat to the community. In addition, feeding wildlife encourages them to reproduce in greater numbers than the habitat can support. For all these reasons, and for the sake of long-term safety to the public and Texas wildlife, no one should intentionally feed alligators. If you observe someone else feeding alligators, please report them for the safety of all. Since October 1, 2003, it has been a Class C misdemeanor punishable by a fine of up to $500 for anyone caught feeding an alligator. Why can’t we just trap and move the Alligators elsewhere? For alligators that are not causing any problems, there’s no reason to move them. It’s a huge tax-payer expense to trap and remove wildlife that are not causing harm. Furthermore, removal is only a short-term solution, as any habitat that can support alligators will continue to have more move in. Moving animals always brings with it the risk of transplanting disease, and relocation is not always a viable option, as by nature these animals are territorial and relocated animals may be killed or run out of a new area. What is needed, instead, is an educated public that’s able to recognize the few nuisance alligators and to coexist safely with the majority of alligators that pose no danger to the community. How can I avoid conflicts with Alligators and maintain a healthy mutual respect? Most of us will never have a confrontation with an alligator. Alligators and people can peacefully coexist together. All it takes is a little understanding and healthy respect for the alligator’s needs and habits. Remember that alligators are cold-blooded and their metabolic rate increases as the weather warms, causing them to be more active. You are much more likely to encounter an alligator during warm weather months, rather than in the winter. If you encounter an alligator and there is no immediate danger, leave it alone. Typically alligators are timid and avoid humans whenever possible. If a human comes too close for comfort, usually an alligator will retreat quickly. However Because they sometimes move great distances to meet their survival needs, they sometimes show up in undesirable locations or even on your private property. Your private property is usually a temporary resting place for the alligator and it will likely leave on its own in search of more suitable habitat. Alligators naturally shy away from humans. However, problems arise when people feed alligators, because the animals lose their fear of humans and begin to associate people with food. This produces the potentially dangerous situation described above. An alligator that has been frequently hand-fed will often lunge at an outstretched hand. This action is often interpreted as an “alligator attack” when in reality the alligator has been conditioned to respond to an outstretched hand expecting to be fed. For this reason, it is wrong to feed any wild alligator. Although alligators may appear sluggish or lethargic, they can become quite agile if disturbed or annoyed. People and pets should never approach alligators closely. This is particularly true of nesting females. As with all wild animals, people should treat alligators with respect. Alligator-human conflicts are rare in Texas, and no human fatality has ever been attributed to alligators in Texas. Good judgment on the part of humans can keep incidents at a minimum. If an alligator doesn’t retreat when a person approaches, or if an alligator actively threatens humans, it may have lost its natural fear of people.. The practice of feeding alligators is dangerous, unlawful and contributes to attacks on humans or causing them to lose their fear of humans. NEVER feed or entice alligators. Inform others that feeding alligators is against Texas state law. If you observe others feeding alligators, report them for the safety of all. Alligators generally lose their natural fear of people when they associate food with people. By feeding alligators, people create problems for themselves and others. NEVER feed other wildlife near the water, throw fish scraps into the water or leave them along the shoreline. Although you are not intentionally feeding alligators, the alligator doesn’t understand that. Dispose of fish scraps or other potential alligator foodstuffs properly. DON’T let your pets swim or run along the shoreline of waters known to contain large alligators. Alligators could be attracted to dogs because they are about the same size as a large alligator’s natural prey. DON’T swim or allow pets to swim in areas with vegetation that is growing up out of the water. Alligators favor this type of habitat. Swim in designated areas only. DON’T swim, walk dogs or small children, at night or at dusk, along the shoreline of waters that are known to contain large alligators. Large alligators feed most actively during the evening hours. This is one reason Florida has made it illegal to water-ski after dark. NEVER try to remove alligators from their natural habitat or try to keep one as a pet. It is strictly against the law to do so. Alligators do not become tame in captivity and handling even small ones may result in bites. Instead, enjoy watching and photographing alligators from a distance. IF you hear an alligator hiss, move away. You are too close. IF the alligator is not approaching people or otherwise posing an obvious threat, wait a few days if possible – even up to a week – before contacting Texas Parks & Wildlife. In spring and summer, alligators are moving to breed and find new habitat. Most of the alligators moving around are smaller ones that have been pushed out of their normal habitat by larger alligators. Usually, these smaller alligators will move further on in a week or two. ALLIGATORS have a natural fear of humans, and usually begin a quick retreat when approached by people. If you have a close encounter with an alligator a few yards away, back away slowly. It is extremely rare for wild alligators to chase people. However, never make the mistake of thinking that an alligator is slow and lethargic. Alligators are extremely quick and agile and will defend themselves when cornered. A female protecting her nest might charge a person who gets close to the nest, but she would quickly return to the nest after the intruder left. IT is not uncommon for alligators to bask along the banks of a pond or stream for extended periods of time. These alligators are usually warming their bodies; they are not actively hunting. Often times a basking alligator may be seen with its mouth open; this is a way to cool its body temperature down, since alligators do not pant or sweat. An approaching human should cause these alligators to retreat into the water. (In some cases, the alligator may be protecting a nest). However, an alligator may be considered a nuisance if it leaves the banks of the water body to spend time near homes, livestock pens, or other structures. IF you walk near the water and an alligator comes straight toward you, especially if it comes out of the water, report it to TPWD. It may be an alligator that has been fed by people. IF you see an alligator while walking a pet make sure that your pet is on a leash and under your control. Your pet will naturally be curious, and the alligator may see an easy food source. Alligators have a keen sense of smell. In areas near alligator sightings it is wise to keep pets inside a fenced area or in the house for a few days, during which the alligator will move on. DO NOT attempt to move an alligator in the road! Notify local authorities so the alligator can be handled safely. IF you see a large alligator in your favorite swimming hole or pond, do not swim with it. Although alligator attacks in Texas are rare, it can happen. The “attack” reports in Texas are usually more accurately described as “encounters.” As with all outdoor activities, realize that wildlife encounters are a possibility. How to report an alligator sighting or concern. State agencies and local wildlife experts are monitoring the population. Community awareness and education is a key element to successfully co-existing with the alligator. Share with your neighbors our website and print off the fliers that are under the FAQ “Additional Information on Alligators”. Do your part to educate by sharing the information. To report alligator sightings, contact the Fort Worth City’s Marshall office at Lake Worth, 817-237-9090. By reporting a sighting, the population can be monitored and managed. If you believe an alligator is posing a threat to humans, contact Texas Parks and Wildlife’s district office, 817-831-3128 or after hours or weekends 800-792-4263. Fort Worth Nature Center and Refugee is an additional contact for alligator information. and some of our freshwater lakes and rivers provide appropriate habitat needed for alligators to survive. As when dealing with any other urban wildlife species, we humans must be responsible for our behavior. We’re here to stay, and so are alligators! You can do a lot to reduce conflicts! Changing the behavior of alligators requires changing our own behavior. Alligators were once an endangered species, but their numbers have recovered due to successful protection programs. In Texas they are now a protected game species. A permit is required to hunt, raise or possess an alligator in Texas. It is illegal to feed, kill, disturb or attempt to move an alligator. Violators should be reported to Texas Parks & Wildlife’s Operation Game Thief at 1-800- 792-4263 (GAME) or TPWD Operation Game Thief. 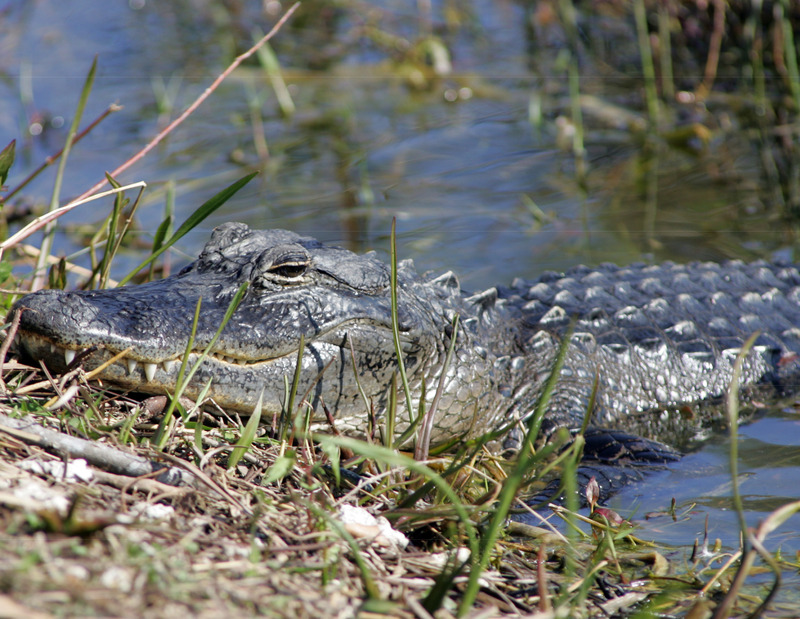 To discuss coexisting with alligators in Texas, call the Texas Parks & Wildlife Alligator Program at (409) 736-2551. To report an alligator that poses a threat, please contact Texas Parks & Wildlife at 1-800-792-4263.
Credit to Kathy Milacek for writing this article.